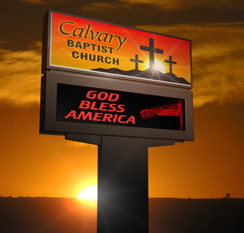 People call them all kinds of names: electronic message boards or displays, electronic message centers, digital signs, marquee signs and electronic display systems just to name a few. 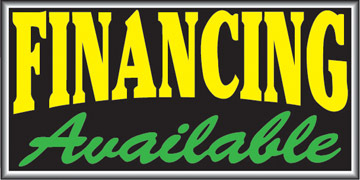 At Signs by Art, we keep it simple: "LED signs," no matter the size or placement. And we want you to be comfortable knowing whether an LED sign is right for your business or organization, so take a moment to learn more about them. The more you know, the surer you'll be that you've made the right decision. Light Emitting Diode. An LED is not a light bulb, but is an efficient, effective, ultrabright alternative that cannot burn out. The LEDs in Watchfire signs typically last longer than 11 years! Pixel pitch is the distance between each pixel on your sign. A pixel is a cluster of two or three LEDs. The closer the pixels, the crisper and more lifelike your image will be. For instance, our sharpest and highest resolution option is 16mm, which means each pixel is a mere 16 millimeters apart (making it the premier sign in the outdoor LED industry). Monochrome LED signs have long set the standard for effective LED signage and are a proven way to get results. They're particularly ideal if you have a text-driven message you'd like to customize from time to time. 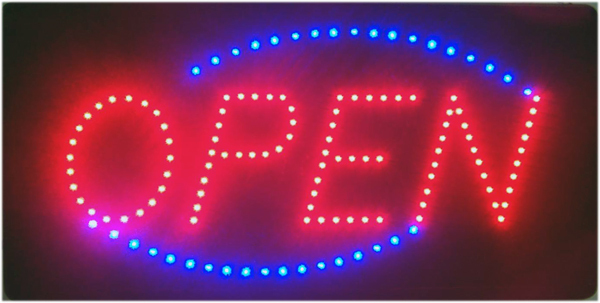 But if you have a product you'd like to show in all its splendor, or if you'd like to play snippets of videos or animation and take advantage of other advertising tactics previously only available on TV and the Internet, you might want to consider a color LED sign.ere to add text. 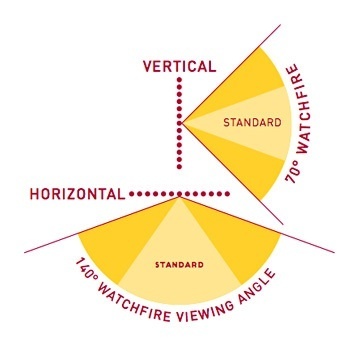 Our View on Viewing Angle. Viewing Angle is the angle at which the LEDs brightness is halved. An LED is at full brightness when you look at it straight on - or dead center. If that level of brightness is halved by moving 35° from dead center, the viewing angle is considered to be double that number - 70°. Reading Angle is the angle at which a people can adequately read your LED message and, while typically greater than the viewing angle, varies depending on lighting circumstances and a sign's environment. Watchfire XVS LED displays will give you a Viewing Angle of up to a 140° horizontal (off to either side) x 70° vertical (looking up or down at the sign), which is easily among the best in the outdoor sign industry. Just something to keep in mind when you consider how wide an audience you want to reach with your LED sign.